My name is Sonia. I am quite religious. I think there are many ways to God. I think it is very intolerant to insist your religion is right. Although I don’t go to church I regard myself as a good Christian. I give to charity and do my bit for society. It doesn’t matter what you believe as long as you are sincere. My name is Percy. I am a Christian. I believe in God but I think faith is a personal matter. I do have a Bible and if I had more time, I’d probably read it. I go to church occasionally but find it a little boring and irrelevant. I prefer to dialogue with friends online about religious issues. I think you should live out your faith in what you do. My name is Delia. I am an Anglican. I have been baptised and confirmed and was brought up to go to Church on Sundays. I find meaning and comfort in the liturgy, the choir and the church calendar. Taking communion is important to me. If I ever have a question, I can always ask my priest. My faith provides me with security in a changing world. My name is Sebastian. I believe in Jesus Christ. I prayed to receive him when I was a student at university. I pray every day and read my Bible occasionally. I get to Church maybe once a month but I have a busy weekend schedule. There’s golf, the family to see and the shopping. Most people at work know that I am a Christian. My name is Freddie. Jesus is my Lord and Saviour. Church? I wouldn’t be anywhere else on Sundays. It’s my family. I can’t wait to be with them. We share our lives together, the joys and sorrows. Mid week we have a Bible study group. We support and pray for one another other. They give me the strength to share my faith and work. By God’s grace, he has used me to lead others to Jesus Christ. Membership 1: To Follow the Example of Christ from Stephen Sizer on Vimeo. I wonder with which of these five people you identify? They all call themselves Christians. According to the National Office of Statistics, 72% of people in Britain describe themselves as Christians. The other faiths combined represent just 5%. If 72% call themselves Christians yet only 10% attend church regularly, we have some kind of disconnect between perception and practice. How do we define what it means to be a Christian? To understand the diversity among professing Christians, Christianity Today undertook a survey of more than 1000 self-identified Christians. The results identify five distinct types – named Active, Professing, Liturgical, Private and Cultural Christians. Active Christians (such as Freddie) are most likely to have a personal faith in Jesus Christ that affects their beliefs and inspires an active church life; Cultural Christians (such as Sonia) are least likely to align their beliefs and practices with biblical teachings, or attend church. Between the two is a range of beliefs, commitment levels, and public practice of the faith. The survey shows that for nearly half of Christians, involvement in a local church body is a minimal part of their daily lives. The local church is no longer considered the only outlet for spiritual growth. Churches must develop relational- and community-oriented outreach. Lay people have to be better equipped to be God’s ambassadors. I would add a fourth. We must be more intentional in helping Christians value their corporate identity as members of the local Body of Christ. Only in fellowship can we truly grow up to maturity in Jesus Christ. The realisation that all was not well in Britain is something the Church of England faced as long ago in the 1940s as Britain began to rebuild itself after the Second World War there was a sharp decline in church attendance and a rise in individualism and recreational alternatives to church. The then Archbishop, William Temple, commissioned a radical report entitled “Towards the Conversion of England” which called for greater emphasis on evangelism in the work place and the use of the media. Alongside this strategy the Church of England also defined what it means to be a follower of Jesus Christ. 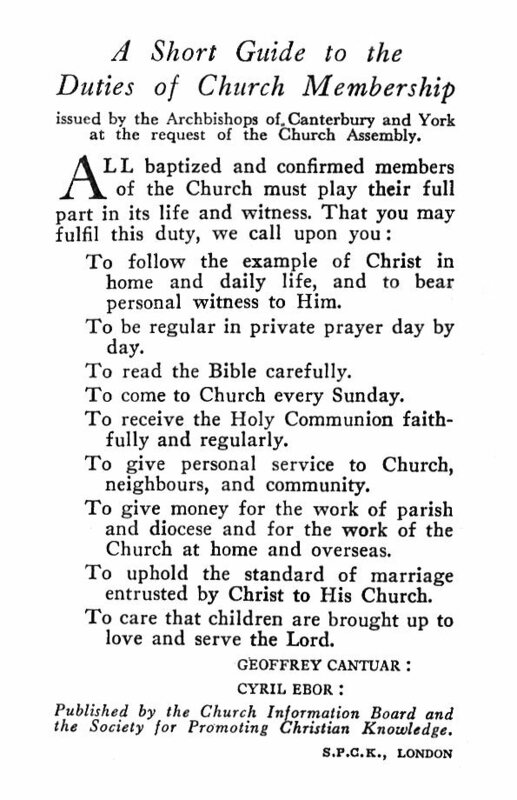 In May 1954, at the request of the Church Assembly, the Archbishops of Canterbury and York issued “A Short Guide to the Duties of Church Membership”. Many years ago, we adopted this guide as the basis for our own Membership Declaration which we reaffirm annually at Easter. You should have received a copy when you came in this morning. Back in the 1960’s C.S. Lewis wrote a very helpful essay on church membership in which he reminds us that : “The very word membership is of Christian origin, but it has been taken over by the world and emptied of all meaning.”Today, most people associate the term “membership” with exclusive clubs, breakdown services and air miles. The Scriptures provide a very different model of membership. 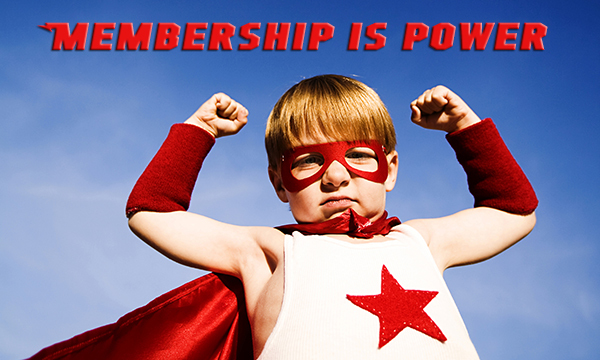 Membership is about joining a family, about becoming a vital and unique organ of a living body. We are all born into a biological family. But when we become a child of God, we are born again into the family of Jesus – a spiritual family! When we receive Jesus and decide to follow him, we become members of his family. Other believers become our brothers or sisters too! That is why we are called Christ Church because we are Christ’s church family. It gives me the accountability I need to grow (Ephesians 5:21). Today we come to the first of nine privileges of church membership: We encourage all who regard themselves as Christians and who identify with Christ Church “To follow the example of Christ at home and daily life, and to bear personal witness to him.” What does it mean? To follow Christ must involve every part of me. To be meaningful, it must involve my mind, my heart and my will. Please turn with me to John 13. Lets learn from what Jesus knew, what Jesus did and what Jesus taught about how he expected his followers to behave toward one another. Three things we are told Jesus ‘knew’. First, “Jesus knew that the time had come for him to leave this world and go to the Father.” (John 13:1) He knew he was rapidly approaching the most important moments of his life. His destiny from eternity past. He knew that the pain, the shame and the agony of the cross was before him. Here is the question: If you knew that you would die tomorrow, what would you do tonight? I would spend the time with my family, I’d write some short letters to family I care about but too far to visit and I’d make sure my will is in order. Not Jesus. John wants us to see something significant about Jesus. Fully God and fully man, Jesus is facing something we cannot imagine. He doesn’t say to the disciples, “Don’t you care about what I’m facing?” His focus is not on himself. He is concerned that they be prepared for what’s about to happen. Jesus is focused on them. Jesus knew the time. Do you? Third, notice something else Jesus knew, “For he knew who was going to betray him…” (John 13:11) Judas, full of deceit, full of hypocrisy, is about to “stab Jesus in the back.” Jesus knows it. What does Jesus do? What would I do? Being stabbed in the back is not that uncommon but what would you do if you knew it was coming? Some people’s motto is “Do unto others before they do unto you.” Not Jesus. Jesus does not distance himself from Judas. Jesus does not point his finger at Judas and say to him, “How dare you—after all I’ve done for you?” Instead he loves him to the end. He does everything possible to bring Judas to repentance. Can you wash the feet of your enemies? Will you serve a person knowing it probably won’t be reciprocated? What Jesus knew. He knew his time. He knew his Father. He knew his betrayer. What Jesus knew: Following Jesus involves my mind. “When he had finished washing their feet, he put on his clothes and returned to his place. “Do you understand what I have done for you?” he asked them. “You call me ‘Teacher’ and ‘Lord,’ and rightly so, for that is what I am. Now that I, your Lord and Teacher, have washed your feet, you also should wash one another’s feet. I have set you an example that you should do as I have done for you. Jesus begins with a question: “Do you understand what I have done for you?” Do you? It goes beyond just getting your feet washed. It goes way beyond just getting your need met. Jesus comes into our lives. He loves us. He receives us. He meets our needs. And sometimes people think that’s all this is about—getting my needs met, getting my feet washed. No, it’s about a personal transformation of character and thinking. It’s about becoming a servant like Jesus. In John 13:15 Jesus explains the reason he has done this. “I have set you an example that you should do as I have done for you.” If my experience in God is only about me, only about me getting my needs met, I’ve missed the point of being saved. We are saved to serve. Archbishop William Temple once said, “The Church is the only society that exists for the benefit of those who are not its members.” If church is just about me getting what I want, I’ve missed the whole point. The greatest human tragedy is surely for a person to never receive Christ and experience his forgiveness. The second greatest tragedy is for a person to experience Christ, experience his love, experience his grace—but never share that blessing with others. Notice Jesus is explicit in telling the disciples why he has done this. “Now that I, your Lord and Teacher, have washed your feet, you also should wash one another’s feet.” (John 13:14). What does Jesus expect of us? That we “…wash one another’s feet.” What does that mean? It means doing what ever it takes to meet the needs of those we encounter. Especially here at Christ Church. Before she died, Mother Teresa visited Phoenix to open a home for the poor. During that brief visit, she was interviewed by the largest radio station in town. In a private moment, the announcer asked Mother Teresa if there was anything he could do for her. He was expecting her to request a contribution or media attention to help to raise money for the new home for the needy in Phoenix. Instead, she replied, “Yes, there is. Find somebody nobody else loves, and love them.” Find somebody nobody else loves, and love them. How? Are you on one of our serving teams? Thank you. Remember you are serving Jesus. Not on one of our serving teams yet? Talk to Penny this week. Is it because you have never let Jesus wash you? Then let him wash you – forgive you and make you his child. Is it because you have yet to acknowledge what Jesus your Lord and Master has done for you? Then acknowledge him. Is it because you have not connected belief in Jesus and membership within his community? Then make the connection. We were created to serve, gifted to serve, shaped to serve, and here commanded to serve. Need some motivation? Jesus promises “Now that you know these things, you will be blessed if you do them.” (John 13:17). This is how to experience God’s blessing. Follow the example of Jesus Christ. May God move us from being cultural Christians, from being private Christians, from being liturgical Christians and even from being professing Christians. May he make each one of us active, fully devoted, followers of Jesus Christ today, as we engage our minds, our hearts and our wills in following him by serving him. By valuing our membership of the Body of Christ at Christ Church. Lets pray. This entry was posted in Anglicanism, Bible, Sermons, Theology on May 4, 2014 by Stephen Sizer.